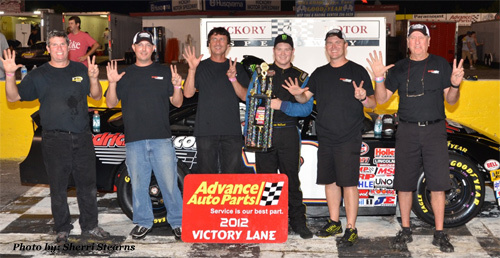 NEWTON, N.C. (August 18th, 2012) It was a beautiful night as Hickory Motor Speedway welcomed Advance Auto Parts as the nights sponsor. The #51 of Josh Wimbish was the fast time for the NASCAR Whelen All-American Series Bojangles Late Models with point's leader Austin McDaniel starting 2 nd in the #12 for the feature event. It was a race early but late in the stages McDaniel pulled away followed by Wimbish, past track champion the #10 of Andy Mercer followed by the #1 of Pietro Fittipaldi, the #43 of Jesse LeFevers rounding out the top 5. The #71 of Bill Powell stood on the pole for the Sportsman Racing Classics 25-lap feature. Powell held the early lead until he was passed by the #16 of Bill Webb. Caution flew on lap 20 for an incident in turn 1 when the #4 of Jerry White hit the wall hard and was through for the night. At the finish it was the #16 of Bill Webb, followed by the #71 of Bill Powell, and the #77 of Ken Webb, the #90 of Dennis Hinkle and the #4 of Robert Webb. Todd Harrington would lead them to the green for the 4-Cylinders race and would assume the early lead. Harrington would pull away for the victory followed by the #51 of Nathaniel Kanupp, #3 of Donnie Harmon, #98 of Robbie Lewis and rounding out the top 5 would be the #59 of Donn Wardo. The #75 of Landon Huffman sat on the pole for Paramount Kia Limited Late Model 35 lap feature and was strong early, followed by the #55 of Zach Bruenger, the #18 of Casey Pierce, points leader #00 of Shane Lee was fourth with the #51 of Jeremy Pelfrey 5 th . There were battles throughout the field until the 1 st caution came out on lap 24 when the #15 of Brandon Atkinson spun down the front stretch after contact with another car. The field would line up 2x2 for the traditional Hickory Motor Speedway double file restart and it would be an 11-lap sprint to the end. A three wide battle between Bruenger, Pierce and Lee ensued with Bruenger taking the 2 nd spot. A four-car battle for 5 th between Lee, Pelfrey, and the #7 of Travis Byrd and the #6 of Brandon Setzer ended with Lee getting the advantage on lap 32. But Pierce would spin on the front stretch with only 3 laps to go after contact with Bruenger setting up an exciting finish. Huffman would bring them to the green with the #12 of Annabeth Barnes working to second. At the checkered it was Huffman followed by Pelfrey, Byrd, Setzer and Shane Lee finishing fifth. The #03 of Kevin Eby would take the pole and lead the field to the green flag in the WrenchRags Street Stock race. Eby would take the early lead followed closely by the #64 of Marshall Sutton, the #5 of Mike Newton and the #33 of Mark Whitten. Sutton would make a bid for the lead and take it on lap 8 with all four battling together. Sutton would lead by more than a car length on the charging Eby. Eby would move to the inside of Sutton with 14 to go as Whitten moved to the inside of Newton. These two battles would continue until a caution on lap 16 when the #92 of Jason Stanley spun in turn 2. On the restart it would be Sutton assuming the lead with Eby in tow. Newton and Whitten were door to door as the #99 of Roy Smith moves into 5 th and moved in on the top 4. But at the line it would be Sutton, followed closely by Eby, Newton, Whitten and Smith rounding out the top 5. Join us for our next race on Saturday, September 1 st , 2012 for the running of the 36 th Annual Bobby Isaac Memorial – Presented by 321 Lawnmower & Hickory Daily Record with the Bojangles Late Models running 150 laps, Paramount KIA Limited Late Models, WrenchRags Street Stocks and Sportsman Racing Classics. Grandstands Open 5 pm, On-Track Autograph Session 6 pm, Racing Action 7pm. Tickets: Adults - $15, Teens/Seniors - $10, Kids 12 and under Free!